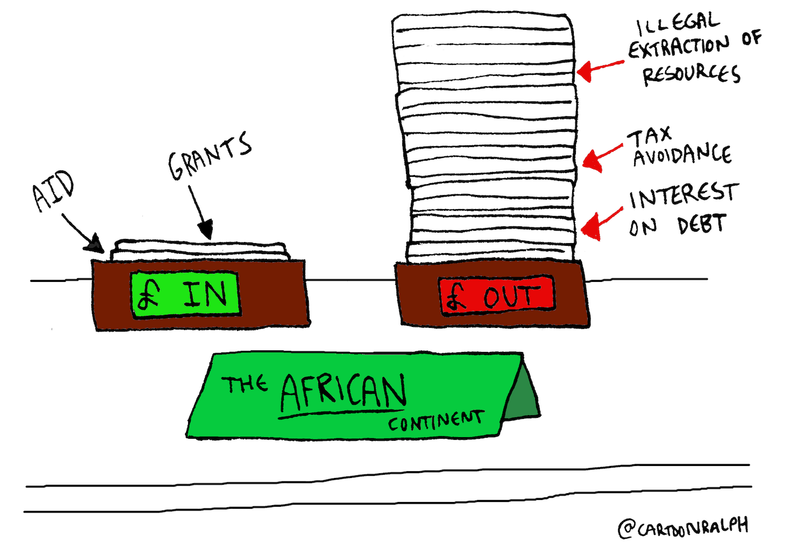 New research by UK campaigners shows that more wealth leaves Africa every year than enters it. Africa is rich, but we essentially steal its wealth, writes Nick Dearden of Global Justice Now. That's the essence of a report (pdf) from several campaign groups released today. Based on a set of new figures, it finds that sub-Saharan Africa is a net creditor to the rest of the world to the tune of more than $41bn. Sure, there's money going in: around $161bn a year in the form of loans, remittances (those working outside Africa and sending money back home), and aid. But there's also $203bn leaving the continent. Some of this is direct, such as $68bn in mainly dodged taxes. Essentially multinational corporations "steal" much of this - legally - by pretending they are really generating their wealth in tax havens. These so-called "illicit financial flows" amount to around 6.1 per cent of the continent's entire gross domestic product (GDP) - or three times what Africa receives in aid. Then there's the $30bn that these corporations "repatriate" - profits they make in Africa but send back to their home country, or elsewhere, to enjoy their wealth. The City of London is awash with profits extracted from the land and labour of Africa. There are also more indirect means by which we pull wealth out of Africa. Today's report estimates that $29bn a year is being stolen from Africa in illegal logging, fishing and trade in wildlife. $36bn is owed to Africa as a result of the damage that climate changewill cause to their societies and economies as they are unable to use fossil fuels to develop in the way that Europe did. Our climate crisis was not caused by Africa, but Africans will feel the effect more than most others. Needless to say, the funds are not currently forthcoming. In fact, even this assessment is enormously generous, because it assumes that all of the wealth flowing into Africa is benefitting the people of that continent. But loans to governments and the private sector (at more than $50bn) can turn into unpayable and odious debt. Ghana is losing 30 per cent of its government revenue to debt repayments, paying loans which were often made speculatively, based on high commodity prices, and carrying whopping rates of interest. One particularly odious aluminium smelter in Mozambique, built with loans and aid money, is currently costing the country £21 for every £1 that the Mozambique government received. British aid, which is used to set up private schools and health centres, can undermine the creation of decent public services, which is why such private schools are being closed down in Uganda and Kenya. Of course, some Africans have benefitted from this economy. There are now around 165,000 very rich Africans, with combined holdings of $860bn. But, given the way the economy works, where do these people mainly keep their wealth? In tax havens. A 2014 estimate suggests that rich Africans were holding a massive $500bn in tax havens. Africa's people are effectively robbed of wealth by an economy that enables a tiny minority of Africans to get rich by allowing wealth to flow out of Africa. So what is the answer? Western governments would like to be seen as generous beneficiaries, doing what they can to "help those unable to help themselves". But the first task is to stop perpetuating the harm they are doing. Governments need to stop forcing African governments to open up their economy to privatisation, and their markets to unfair competition. If African countries are to benefit from foreign investment, they must be allowed to - even helped to - legally regulate that investment and the corporations that often bring it. And they might want to think about not putting their faith in the extractives sector. Aid is tiny, and the very least it can do, if spent well, is to return some of Africa's looted wealth. We should see it both as a form of reparations and redistribution, just as the tax system allows us to redistribute wealth from the richest to the poorest within individual societies. The same should be expected from the global "society". To even begin to embark on such an ambitious programme, we must change the way we talk and think about Africa. It's not about making people feel guilty, but correctly diagnosing a problem in order to provide a solution. We are not, currently, "helping" Africa. Africa is rich. Let's stop making it poorer. Nick Dearden is the director of UK campaigning organisation Global Justice Now. He was previously the director of Jubilee Debt Campaign.